← Why Are Cell Phone Towers Going Up on Public Schools All over the Country? There are growing concerns that radiofrequency (RF) emissions from wireless utility “smart” meters cause serious adverse health impacts. Unfortunately, no human health impact studies were conducted prior to the deployment of RF emitting smart grid technologies, which include the smart meters themselves as well as the associated gatekeepers and routers that are part of the overall mesh communications network for each utility’s smart grid system. Peer-reviewed studies as outlined in the BioInitiative Report 2012 support an assertion that adverse biological effects should be expected based upon the RF radiation levels produced from wireless smart meters. For information on published studies showing biological effects from RF exposure from various emission sources, one can review summary information charts contained within The BioInitiative Report 2012, and specifically, relevant charts available at the following link: BioInitiative Report Color Charts for Reported Biological Effects. 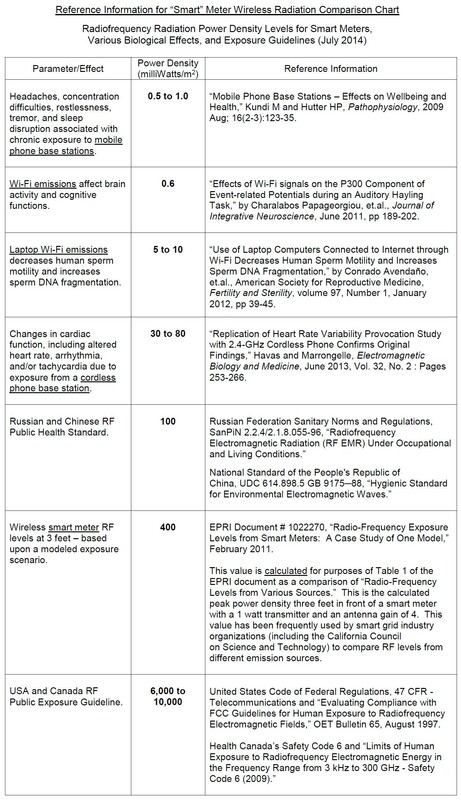 Various governmental RF exposure guidelines that do not fully protect public health. In particular, the guidelines for the USA and Canada were only established to protect tissues from significant overheating and electric shock. The new chart pictured above was developed in cooperation with Stop Smart Meters! The vertical axis of the above chart represents an RF power density for each displayed parameter. The units of measure selected for the vertical axis are milliwatts per square meter (mW/m2). The selected units for the vertical axis work well for relating the RF power density shown to the total RF power that an adult human might receive. The surface area of an adult (male) human is about 2 square meters (m2). So the surface area that an adult human presents to an RF wave arriving from the front, or from the back, is about 1 square meter (m2). One (1) milliwatt (mW) is one-thousandth of a watt. Thus, when an adult human faces an oncoming wave of radiation with a power density of, say, 10 milliwatts per square meter (mW/m2), that human will receive a total of 10 milliwatts (mW) of radiation over the entire body. That is, the number describing the power density will be the same as the number describing the total power received, even though the units of measure are different in the two cases. Descriptive terms used on the above chart are somewhat simplified for purposes of conveying information to the reader in an easy way and getting everything to fit on one chart. More complete reference information is provided below. Somewhat expanded basis information for the above chart values is provided in the linked PDF document shown below. Power density is likely just one parameter which may be used as a measure for predicting adverse health effects due to exposure to RF emissions. Published studies have shown that other characteristics such as the intermittence and modulation of the RF signal, as well as the overall duration of exposure (i.e., short-term vs. chronic) also play a role. As mentioned above, the smart meter radiation level delineated in the chart is a value calculated based upon a modeled scenario described in EPRI Document # 1022270, “Radio-Frequency Exposure Levels from Smart Meters: A Case Study of One Model,” February 2011. The value of 40 µwatts/cm2 (or 400 mW/m2) at three (3) feet in front of the smart meter should be valid for the model of smart meter analyzed in the EPRI document. Technically speaking, the 400 mW/m2 represents the RF power density value during signal transmission where wireless smart meters generally transmit that signal intermittently over time. It is not expected that the 400 mW/m2 RF radiation level would represent the typical exposure level for residents in homes where smart meters are normally mounted external to the home or when people spend most of their time at distances greater than three (3) feet from their smart meter. Based upon a technical review of available reference documentation and test results, SkyVision Solutions would generally state that a typical maximum indoor RF level associated with wireless smart meters would be about 10 mW/m2. The point of this explanation is that, based upon information presented below, it should not be considered uncommon to find RF measured values in homes in the range of 1 to 10 mW/m2 or slightly greater than that range. In fact, if you are in a room of a home with a smart meter on the other side of one of the room walls, the likelihood can be quite high that exposure levels will be within the range of 1 to 10 mW/m2. These values are still well in excess of levels found in published studies showing bioeffects and adverse health impacts for various RF emission sources. In some situations where a smart meter is not installed on the outside of a home or business but rather on an inside wall, then indoor RF levels may certainly exceed the “typical” maximum value mentioned above. 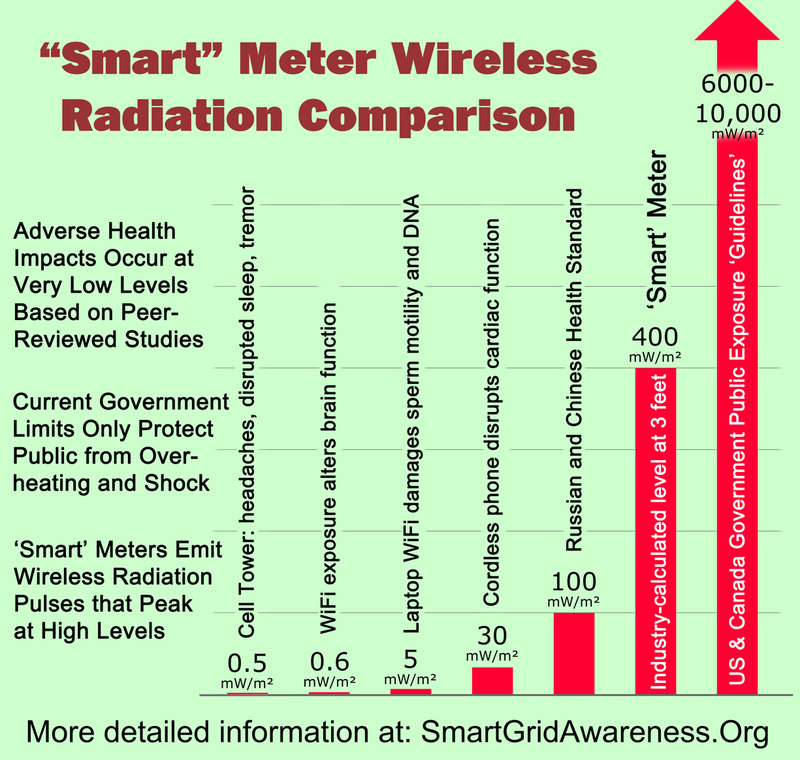 In those instances, the expected RF levels would more closely compare to the value shown in the above “Smart” Meter Wireless Radiation Comparison chart. A review was conducted of EPRI Report # 1021829, December 2011, “Characterization of Radio Frequency Emissions from Two Models of Wireless Smart Meters.” This report provides industry accepted values for two specific models of smart meters each containing a nominal 1 watt RF transmitter. Refer to link at: http://www.epri.com/abstracts/Pages/ProductAbstract.aspx?ProductId=000000000001021829. Refer to page 13 at link: https://skyvisionsolutions.files.wordpress.com/2014/06/fl-psc-joint-iou-presentation-on-smart-meters.pdf. In situations where the nominal RF transmitter output is in the range of 200 to 300 milliwatts as is the case in the Richard Tell study within the state of Vermont, then typical RF indoor maximum RF levels would appear to well less than 10 mW/m2. In the 2013 report published by Richard Tell Associates, there were 141 indoor residential measurements where the peak indoor measurement was approximately 5.0 mW/m2. Based upon information on page 45 of the Tell report, approximately 10% of the indoor measurements were greater than 0.6 mW/m2 (but yet less than or equal to 5.0 mW/m2). Reference: Page 45 at: https://skyvisionsolutions.files.wordpress.com/2014/01/vermont-dps-smart-meter-measurement-report-final.pdf. Dr. Karl Maret performed smart meter-related measurements early in 2014 where he found RF radiation power density measurements with frequent pulses in the range between 2 to 4 mW/m2. 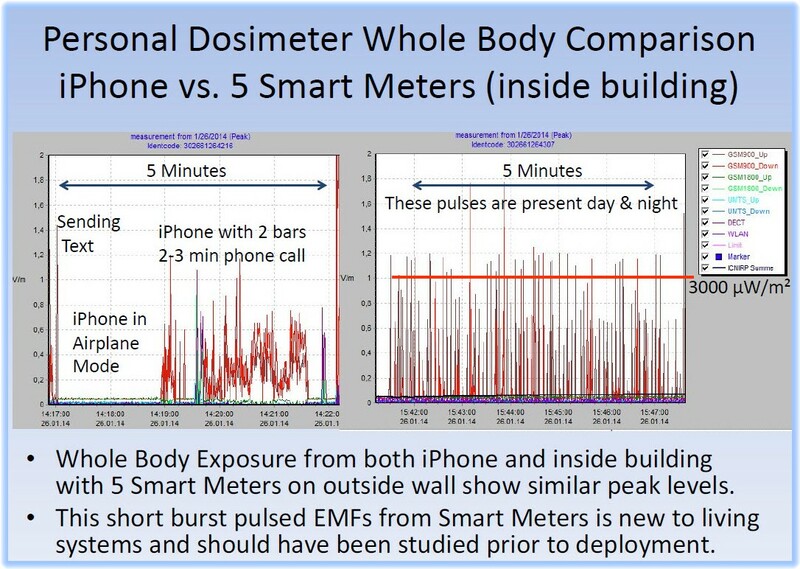 These measurements were performed inside a building where five (5) smart meters were located outside the building. Refer to the figure below which is a slide selected from the following file: Maret.Presentation.January 2014. Note that in an actual home, where a smart meter faced toward a bedroom wall, calculated exposure levels in the bedroom were expected to be 5 mW/m2 at a distance of two (2) meters from a smart meter as discussed in a blog article at http://smartgridawareness.org/2013/09/20/smart-meter-home/. (Refer to home layout picture below.) A family member of the home’s occupant reported measured levels consistent with the values calculated by SkyVision Solutions although these values were not presented in the article because the peak measured levels were not formally documented. Commonwealth Edison (ComEd) performed an indoor smart meter measurement as part of a YouTube video discussing RF concerns. 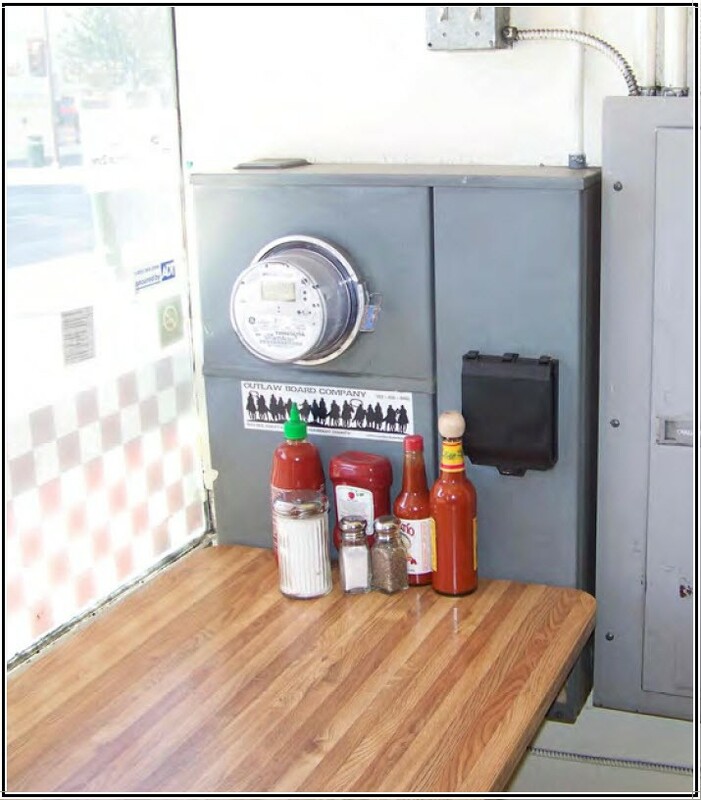 This measurement was taken inside a utility customer’s kitchen and was indicated to be 910 µwatts/m2 or about 1 mW/m2. This measurement was said to have been verified by an independent third party. The video further stated that “placing a baby monitor about two feet from a transmitting baby monitor exposes the child to roughly the same RF emissions that one would receive in KC’s kitchen.” For further information regarding this video, refer to the link at: http://smartgridawareness.org/2014/01/22/comed-compares-smart-meters-to-baby-monitors/. This webpage was updated on December 7, 2014.